New Scotland Yard on the Move? Budget cuts and staffing reductions are causing the police in London England to re-evaluate their accommodation needs. One of the cost cutting measures being looked at is moving from their current headquarters, New Scotland Yard, to a smaller facility. 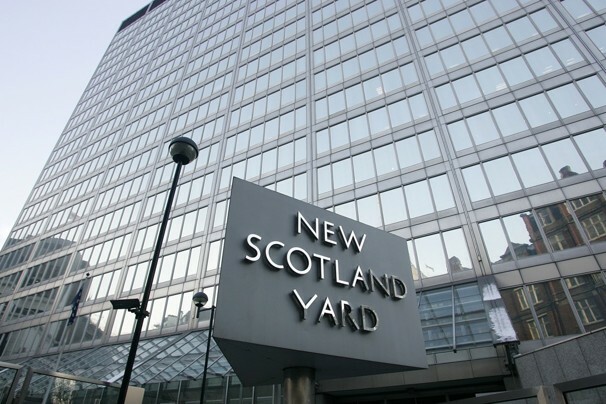 New Scotland Yard has served as the headquarters for London Police Since 1967. Prior to moving to the new Scotland Yard in 1967, the headquarters was located in the Norman Shaw Building (1890-1967), Great Scotland Yard (1875-1890) and prior to that at 4 Whitehall Place, which had a rear entrance to a street called Great Scotland Yard. The name Scotland Yard has been synonymous with policing in London since the formation of the Metropolitan Police by Sir Robert Peel in 1829. The move to a smaller facility would save the City of London in the range of 10.5 million dollars annually. 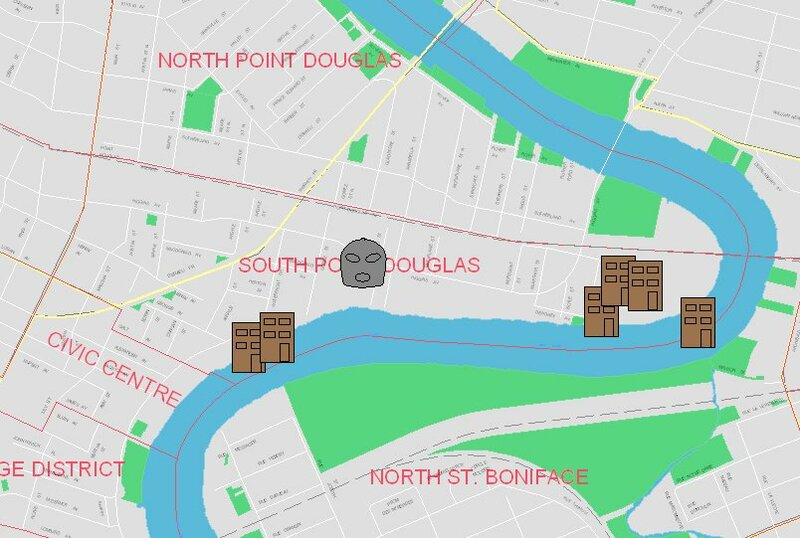 While the crime rate (for the crimes types reported on Crimestat) in north Winnipeg (police District 3) is basically static a study of specific north end neighbourhoods shows a much different picture. Crime in neighbourhoods in close proximity to William Whyte is showing a disturbing trend. The crime rate in these high crime neighbourhoods is rising, in some case dramatically. The recent multiple shootings in the north end have again focused attention on this part of the city. It is unfortunate that the only time these high crime neighbourhoods get attention is in times of tragedy. The map below depicts the crimes tracked on Crimestat for the south-east portion of District 3. 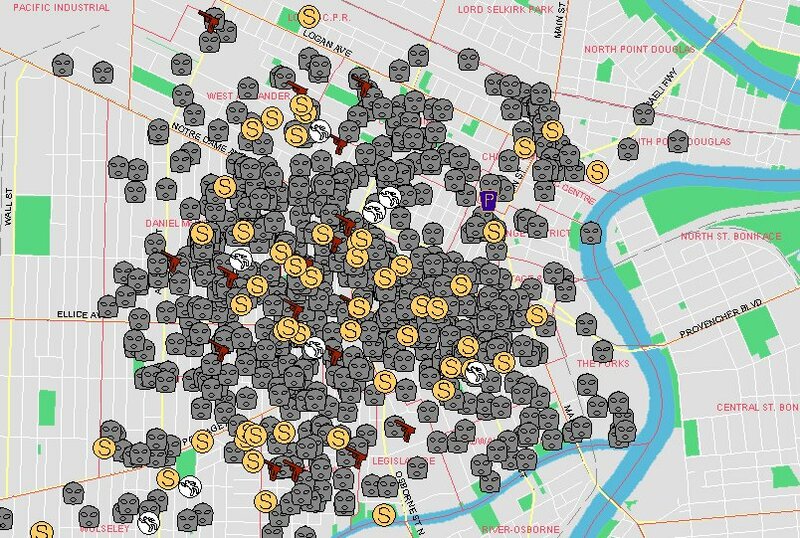 The crime rate in these neighbourhoods is such that the icons depicting the various crimes overlap each other and it is difficult to appreciate the severity of the problem. For the sake of clarity one needs to eliminate some of the crime types. The image below illustrates the violent crimes (murder, shootings, robberies and sexual assault) for the area in question. The north end communities clustered around the William Whyte have received sporadic attention over the past couple of years usually related to tragedies such as shootings and homicides. When tragedies occur everyone (the police, the mayor and other civic and provincial politicians and the media) expresses outrage and vows are made to leave no stone unturned to bring the killer(s) to justice. As indicated in a previous post the police flood the area with additional personnel and the hunt is on. Such a sudden influx of police resources is in and of itself not a bad strategy, in the short-term. It becomes problematic when it is the only strategy. 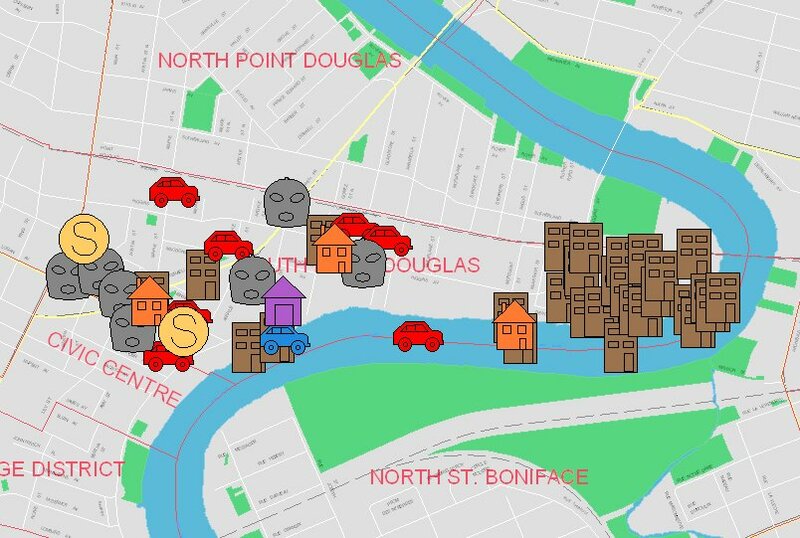 Flooding high crime neighbourhoods with additional police resources drawn from other areas (operational and geographic) is not a sustainable strategy nor is it a strategy that addresses the long-term needs of the neighbourhood and its residents. Earlier this year police resources were shifted from the north end (and other parts of the city) to the west end to deal with shootings there. Now resources are being shifted away from the west end back to the north end. This endless cycle of shifting resources to deal with emergency situations that crop up is symptomatic of a poorly planned (or unplanned ad hoc and reactive) approach to dealing with crime in high crime neighbourhoods. The secondary flaw in the constant shifting of resources strategy is its reliance on using a strict law enforcement approach to address a much broader social issue. You may be able to apply a strict law enforcement approach and arrest you way out of a purely law enforcement issue but you cannot arrest your way out of a social issue. The problem is that many tradition bound police executives are tethered to the strict law enforcement approach. They are not adequately familiar with cutting edge approaches to neighbourhood redevelopment and neighbourhood capacity building. Many don’t see that as a policing function. It may not be a policing function in the strict sense of the word, but what neighbourhood capacity building does is it empowers people and helps prevent crime. Based on the policing principles laid down by Sir Robert Peel (which in my view are still very applicable today) the prime mandate of the police is crime prevention. The important issue is not how you strengthen neighbourhoods and reduce and prevent crime but rather that you do it. For high crime neighbourhoods in Winnipeg if that means the police need to go down ‘the road less travelled’, then let the journey begin. The nature of the issue (problem) must dictate the approach. As well the nature of the issue must determine the timeline. Complicated social issues cannot be resolved using simplistic short-term strategies and tactics. The question is this: is the Winnipeg Police Service willing to make the leap from using a traditional short-term reactive law enforcement approach to dealing with issues in high crime neighbourhoods to using a long-term proactive approach? The Service certainly has the tools, the personnel and the budget to make it happen. The question is: do they have the will? How the Administration proposes to measure Police Service outcomes related to crime prevention and enhancement of neighborhood safety. This direction resulted in the preparation and submission of a report outlining a Neighborhood Safety and Crime Prevention initiative which became known as Crimestat. For the casual observer, Crimestat is simply a website that displays crime statistics and crime maps. For police, it’s significance is far greater. Crimestat is a management and accountability strategy that directs police commanders to concentrate on emerging crime issues and trends in the area under their command. It forces them to track criminal activity in their area, identify emerging crime trends, develop effective tactics, and deploy resources quickly to deal with emerging trends in their early stages before they develop into a full blown crime spree. Lastly, there is follow-up and assessment by the executive. This is the accountability feature of the process that ensures everyone (commanders in particular) have their eyes ‘focused on the ball’, the ball being crime prevention and crime reduction. 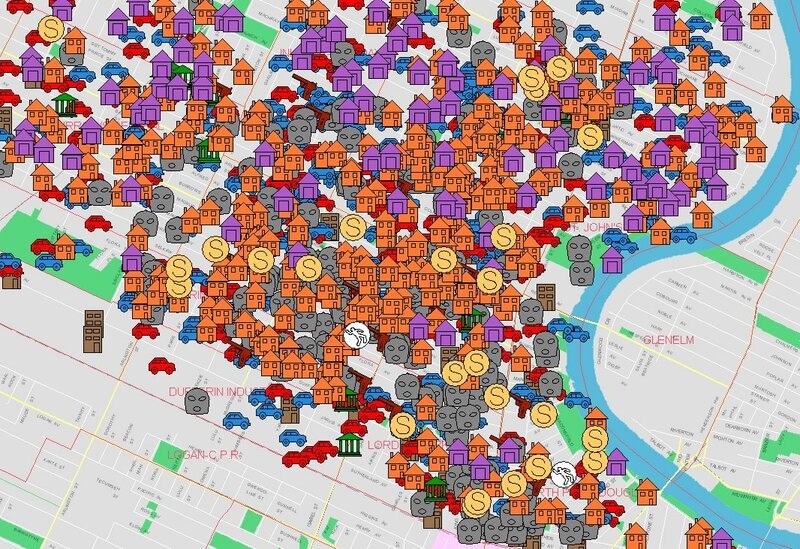 When Crimestat was introduced in Winnipeg in 2007 many were convinced that it could be a useful tool to prevent crime, not in the traditional crime prevention sense in terms of programming, but rather in an operational sense. What is visible on the public side of the Crimestat site is less detailed than what is available on the police side. If one studies the numbers (on the police side), specific crime trends can be seen developing in specific areas of the city. These trends can be nipped in the bud so to speak, largely by identifying and arresting perpetrators. These preemptive arrests prevent the trend from continuing and reduce the amount of crime. It’s not the be all and end all but it is a valuable tool. Like any tool, though, in order for it to work effectively a few basic rules must be followed. 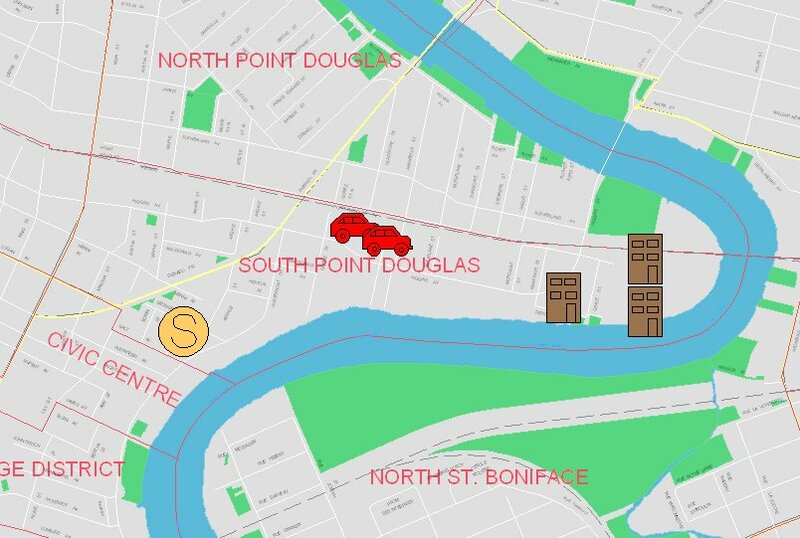 Here is an illustration of how it works: Using the neighbourhood of South Point Douglas as an example we can go back and have a look at the early stages of what looks to be a pattern of commercial break-ins. 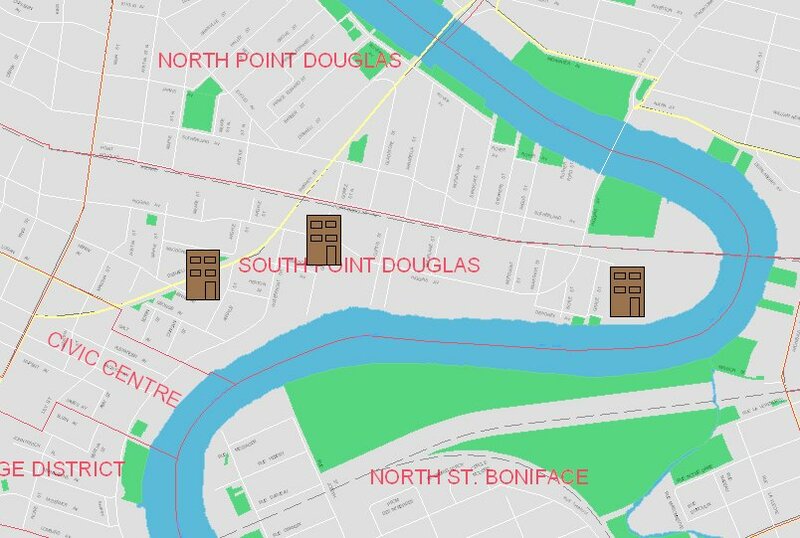 Going back to July of 2009 (on the public site of the Crimestat site you can only go back one year) we see that during the months of July there were 3 break-ins in South Point Douglas. For the sake of this exercise we will make that the starting point of a ‘trend’. This trend continued with 0 in October, 3 in November, 1 in December, 3 in January, 0 in February, 4 in March, 2 in April and 5 in May. 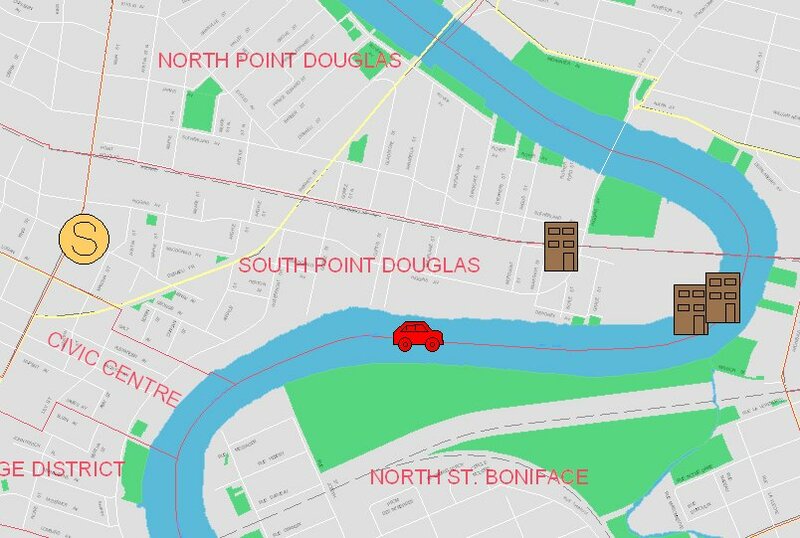 During that 11 month period there were 30 commercial break-ins in the South Point Douglas neighbourhood. Police Commanders are provided with this information virtually in real time. As a trend such as this one develops, commanders assign resources and tactics are developed. That is, if the series of events is recognized as a trend. Because there is a high likelihood that these 30 break-ins in close proximity to each other were not committed by 30 different perpetrators but rather by 1 or a group of individuals known to each other, the trend can be halted by identifying and arresting that individual or group of individuals. Had that been done back in July of 2009 when the first break-ins in South Point Douglas occurred the next 30 could perhaps have been prevented. That is a simplistic example of how division commanders can use Crimestat to prevent crime. The principle can be applied to other crimes at the community level. 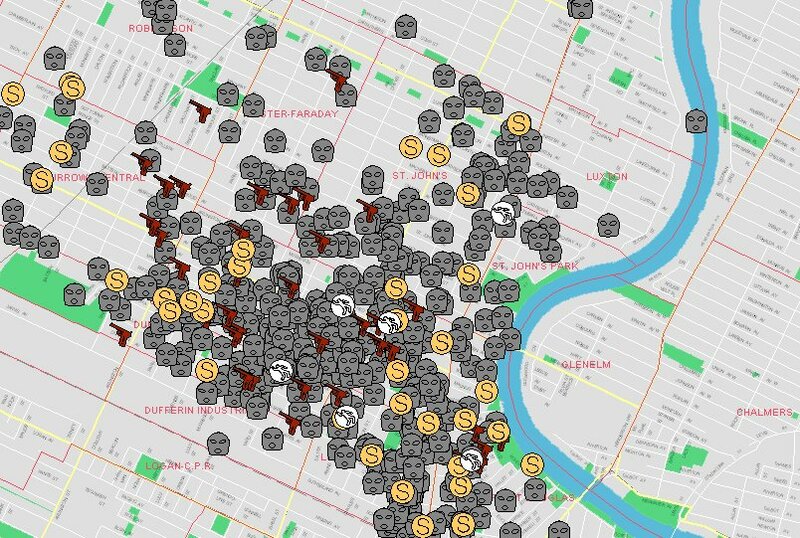 Crimestat was designed to be a tool to track crime in our city’s neighbourhoods. It does that very well. The process has a proven record in helping to combat crime throughout major cities in North America. In order for it to be effective the tool must be used in the manner it was designed to be used. All players in the system must understand and execute their roles. Division Commanders must stay on top of crime in their area, identify trends and devise effective tactics to deal with them. The Police Executive must be fully engaged and ensure the resource is used as intended. The executive of the Winnipeg Police Service does not appear to understand or appreciate the capabilities of Crimestat and that could explain why they have largely turned their backs on it. A key aspect of the Crimestat process centers on accountability. The Executive needs to hold Division Commanders accountable. Accountability is exercised most visibly during Crimestat meetings. That cannot happen if the Executive does not attend Crimestat meetings. Residents of Winnipeg have a vested interest in the overall safety of all neighbourhoods. Winnipeggers need Crimestat to work. 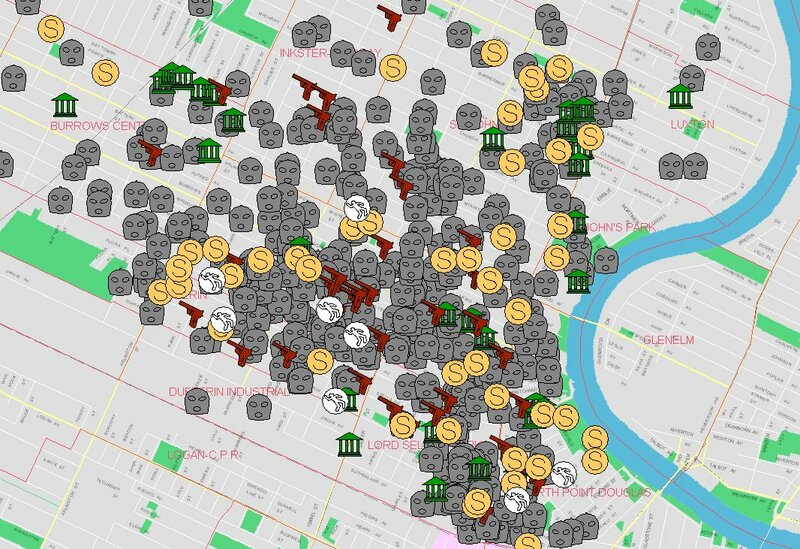 All it takes is a glance at the Winnipeg Police Crimestat website to see that there is no real surprise here in terms of the recent shootings in the City’s West End. And certainly no need on the part of the police to be shocked as they recently claimed. City wide map showing homicides, shootings, sexual assaults and muggings from June 16th 2009 to June 14th 2010. The above map shows two very distinct data clusters, one in District 3 and an even larger one in District 1. 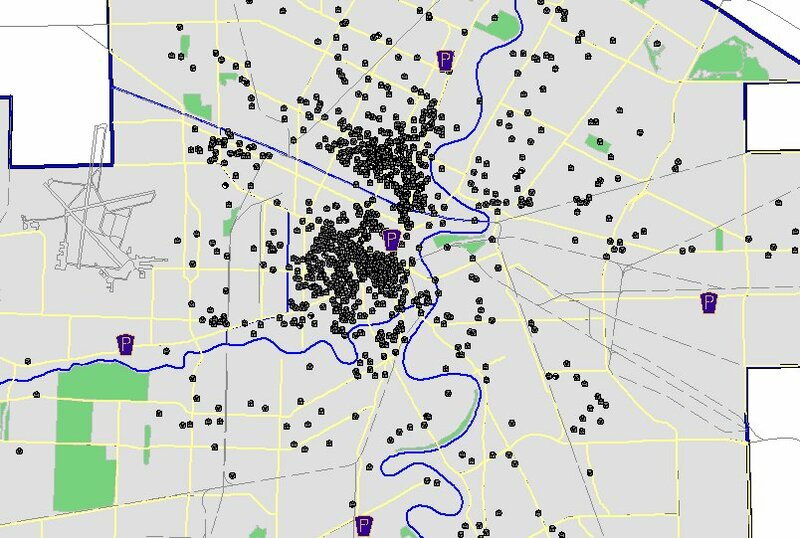 The two maps below show a close up of those two areas and leave no doubt as to the high number of homicides, muggings, shootings and sexual assaults. Crimestat map showing homicides, shootings, sexual assaults and muggings in a portion of District 1 for the period June 16th 2009 and June 14th 2010. These two Districts, and primarily the concentrated areas of the two districts shown above, account for 70% of all homicides, 68% of muggings, 55% of sexual assaults and 88% of all shootings in the entire city for the period between June 16th 2009 and June 14th 2010. Still shocked about what happened recently in the West End? The police response has been predictable. More officers, more guns, more arrests, more seizures. In other words, more visible evidence of police activity. In the next little while we will be seeing reports and statistics outlining those numbers as a testament to the efficiency and effectiveness of the approach being taken by police. Ask yourself, is it really effective in a long term sense? Can you arrest your way out of a social problem? Let’s make sure we don’t get too dazzled by the activity. Let’s look down the road and measure what is being done in the West End based on outcomes. In this case, the absence of crime.